This week was a nice one in a way – no work and just conferencing in Munich! 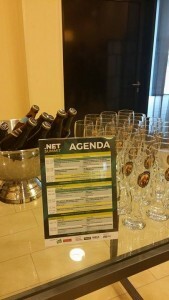 The .Net Summit in Munich has gathered about 40 .Net professionals and “meine wenigkeit” was one of them. 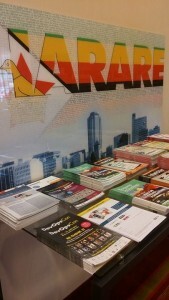 Thus, I have participated in all lectures & workshops and now I will try to summarize them a bit. The second workshop was for Cross-Platform Server Applications with ASP.NET Core. Mr. Rauber has built up a working ASP.NET application, starting from the sample, provided by Visual Studio. On the third day I have chosen to understand a bit more about the cloud solution of Microsoft – Azure. Mr Dobric has shown the possibilities of the cloud platform and has made one step-by-step workshop. Pretty much that is in short all that has happened in Munich. 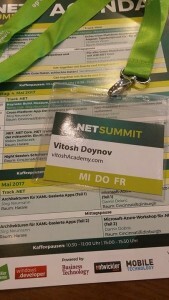 The .Net Summit was a worthy and interesting event!